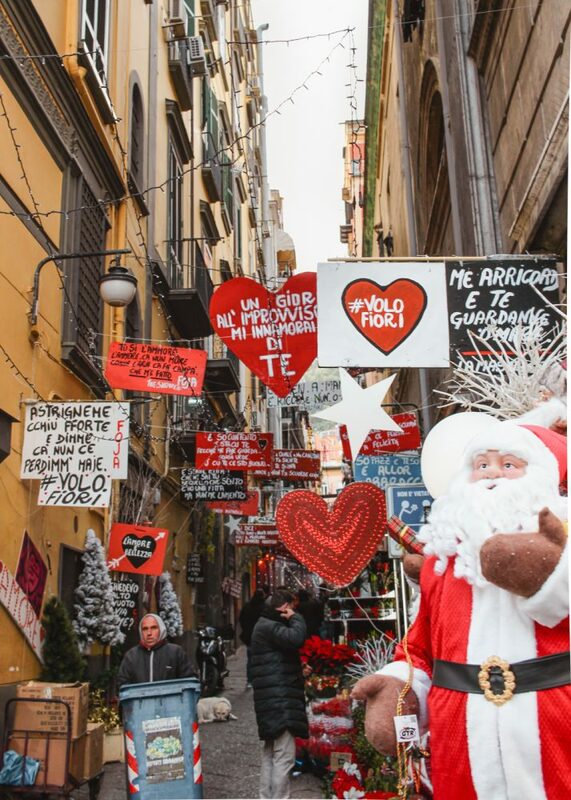 Walking down Christmas Alley in Naples (also known as Via San Gregorio Armeno) is a must do when visiting the city. 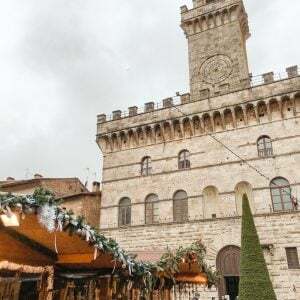 The pedestrian street is only about 200 meters long, but it’s filled with artisan workshops and hundreds of nativity scenese, known as presepe. 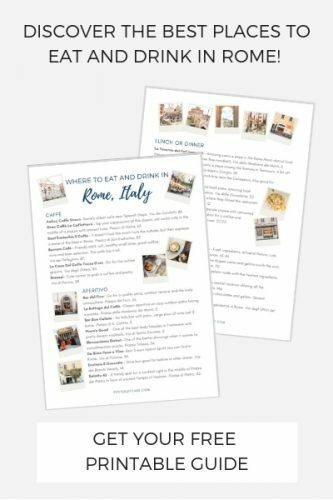 Shops are open all year round (although you should expect some closures in late August when Italians go on vacation for Ferragosto). 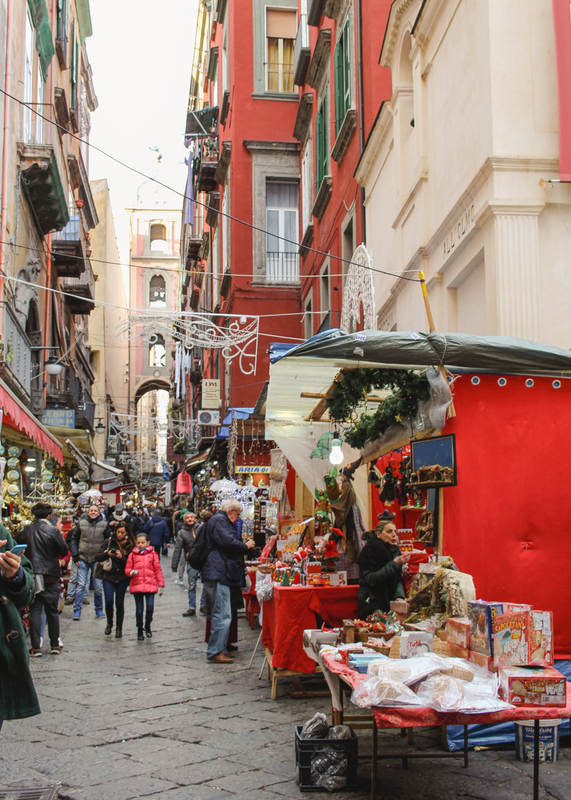 In December, it’s extra festive and feels like Naples’ version of a Christmas market… just don’t expect mulled wine. Christmas Alley is the ultimate place to find specialty figures for a nativity scene. 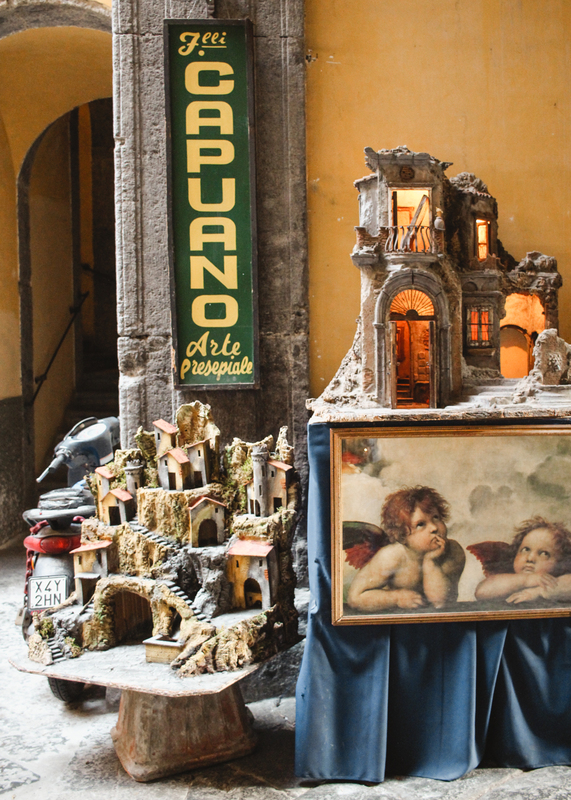 Each shop on the narrow street sells everything to complete a Neapolitan presepe. 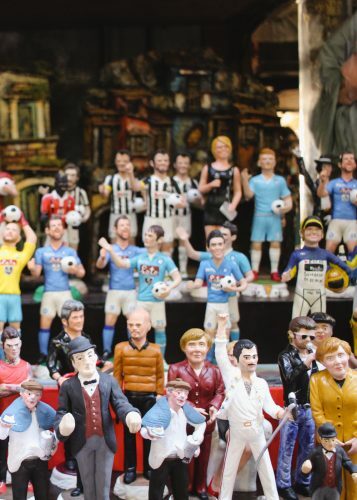 Nativity scenes from Naples aren’t just about Mary, Joseph and Baby Jesus though. They’re elaborate scenes that depict a whole village and are quite unique from your average manger. You’ll also find modern politicians and celebrities right along side biblical characters. 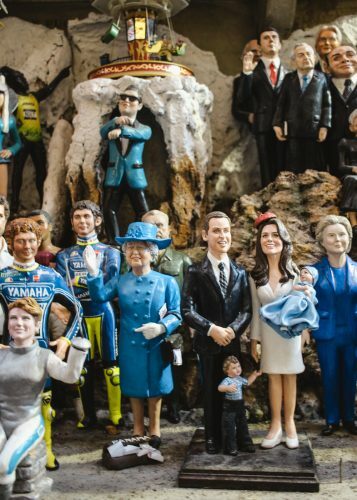 No nativity scene is complete without Elvis. The cost of a presepe can vary greatly depending on quality and size. From miniature baskets to types of cheese, you can choose and customize every detail imaginable in the village. 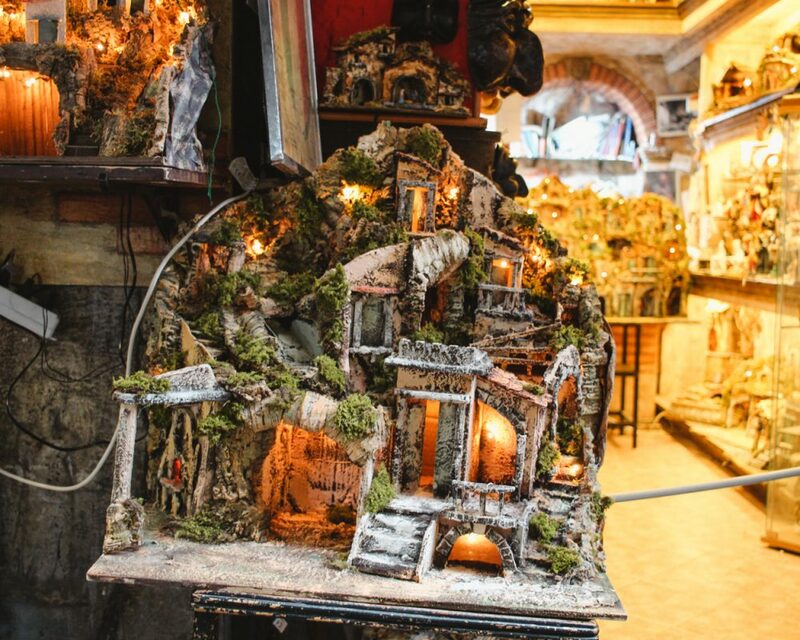 Some pieces can start at just a few euro, but a complete nativity scene with intricate figures could easily cost a few thousand dollars. Some presepe even have a water feature and electricity. 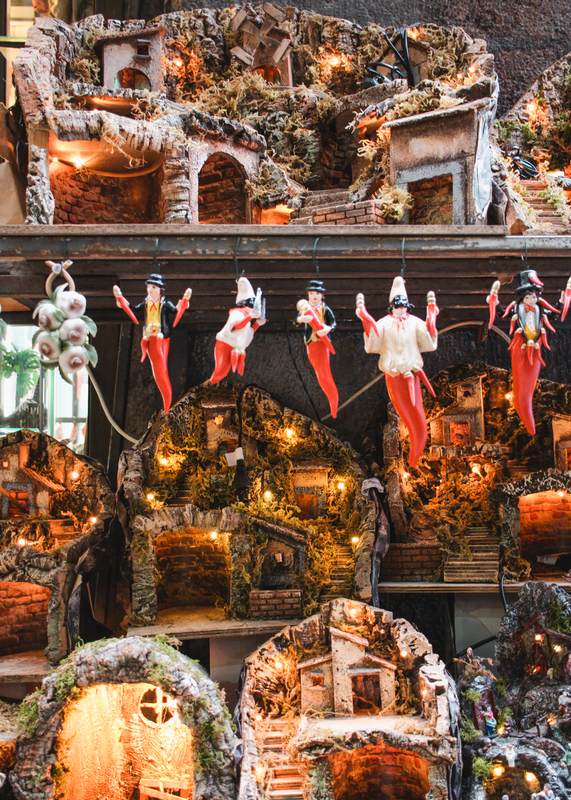 Along with every piece imaginable to build a custom presepe, you’ll also find plenty of Pulcinella figures in the form of ornaments, statues, paintings, keychains… you name it. Pulcinella is a puppet character that’s typically depicted wearing a loose white outfit with a black mask. 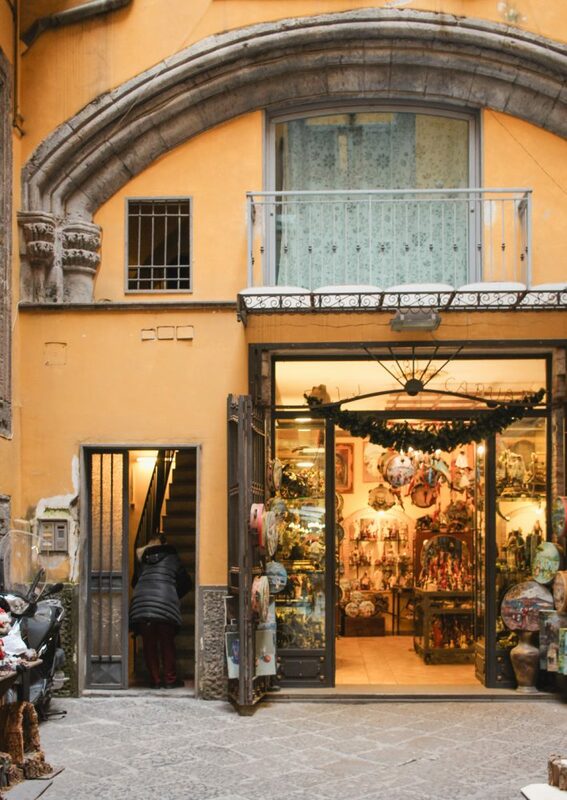 He was first introduced to the commedia dell’arte in 17th century and is still a symbol of Naples today. If you can’t take a whole presepe home with you, a little corno (horn) will certainly fit in your suitcase. These red chilis are said to ward against the Evil Eye and bring good luck. 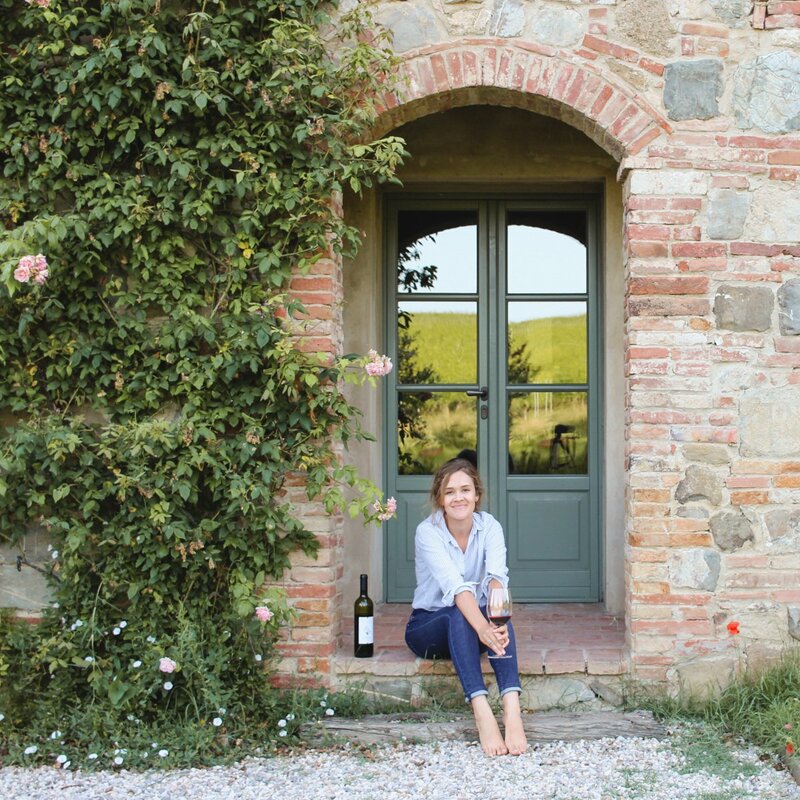 At just a few euros, they also make the perfect gift or souvenir. 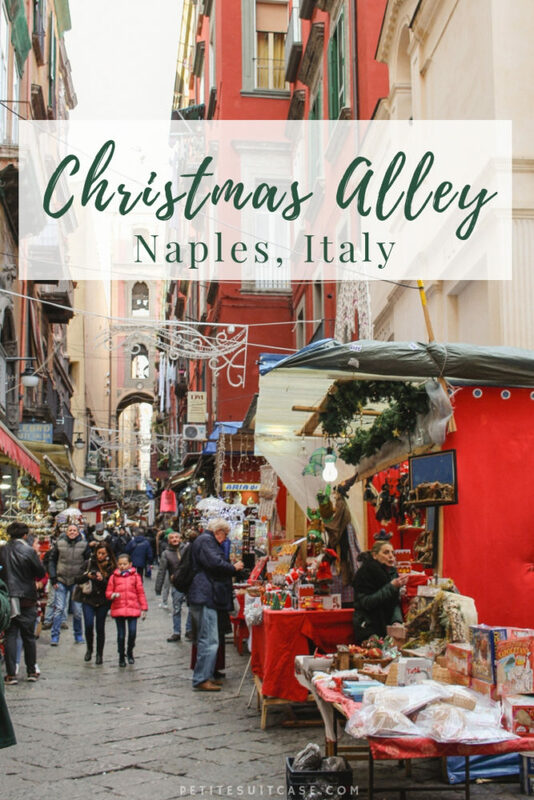 How do I get to Christmas Alley in Naples? 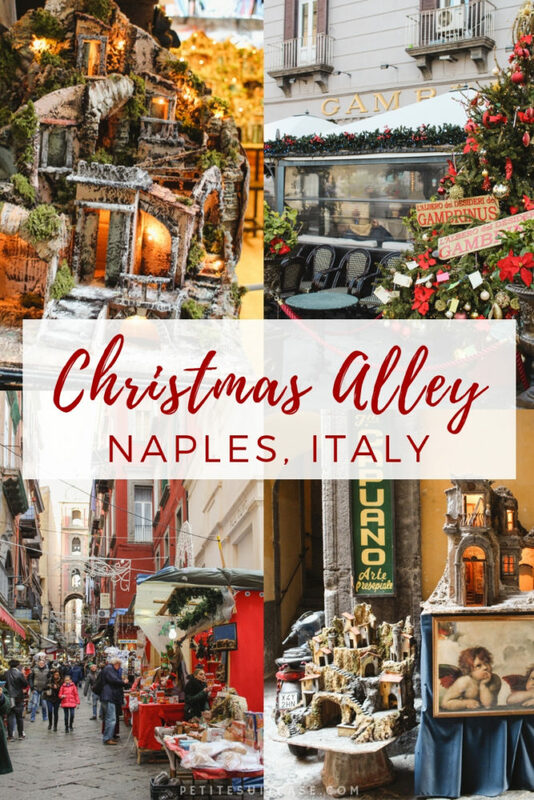 Christmas Alley or Via San Gregorio Armeno is located right in historic district of downtown Naples (find it on Google Maps here). 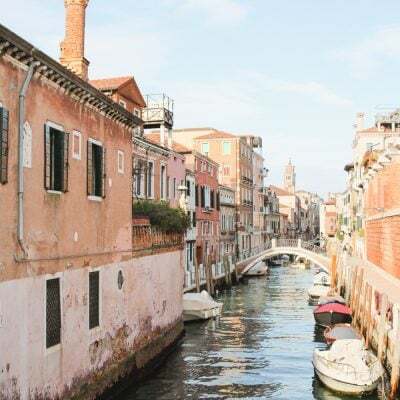 It’s just over a mile from the Alibus bus stop and the main cruise ship port. You can also take the metro to Dante or Museo and then walk about 10 minutes to Christmas Alley. 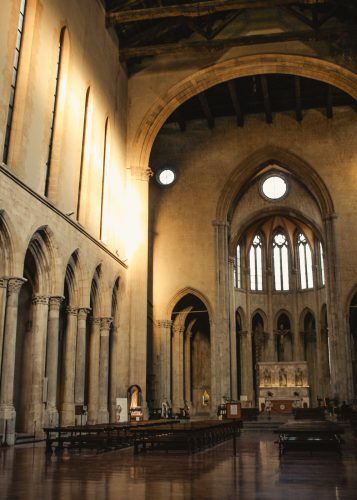 At the north end of the street, you’ll find San Lorenzo Maggiore Basilica. The church was built in the 13th century, directly on top of a Roman market excavated in the 90s. This is also the square where the Napoli Sotterranea (Naples Subterranean) tour starts. I’m slightly claustrophobic so decided to pass on this tour, but I’ve heard it’s unbelievable. I wish I had taken the tour. 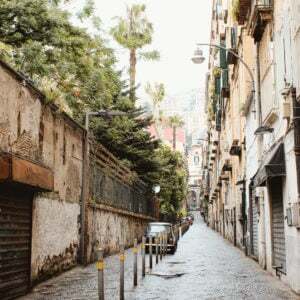 Click here for more information on the Naples Subterranean tour. 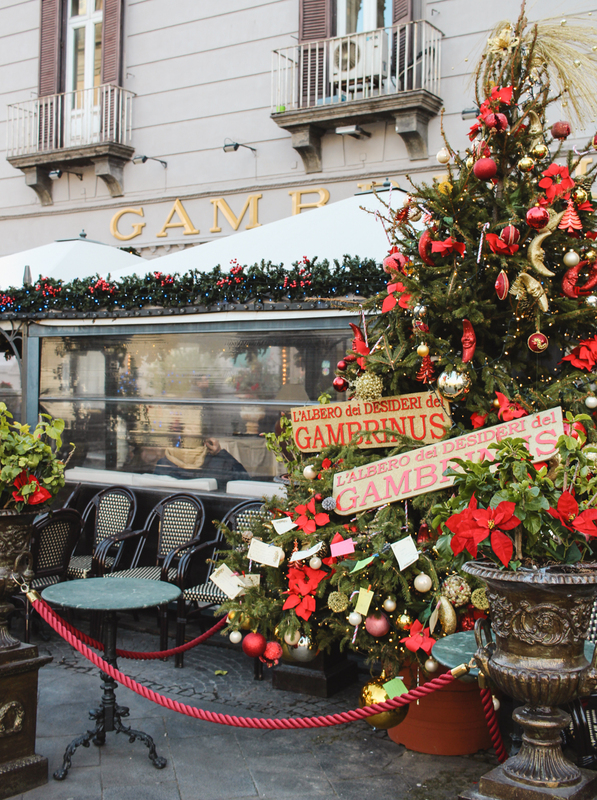 If you’re going to Christmas Alley in Naples, you have to have pizza at the legendary Sorbillo’s and a coffee at Gambrinus. 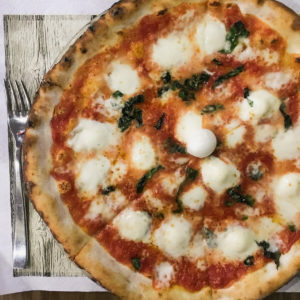 Sorbillo’s is located just around the corner. How convenient.